The Brain Charity is offering two new music therapy workshops for people with dementia and carers. Participation in the sessions will help to improve communication and mobility through the love of music. Workshops are free, but places are limited! Having difficulty speaking is a key cause of depression and isolation for people with dementia. Speech & language therapists can help through exercises and teaching techniques that strengthen the muscles of the mouth. 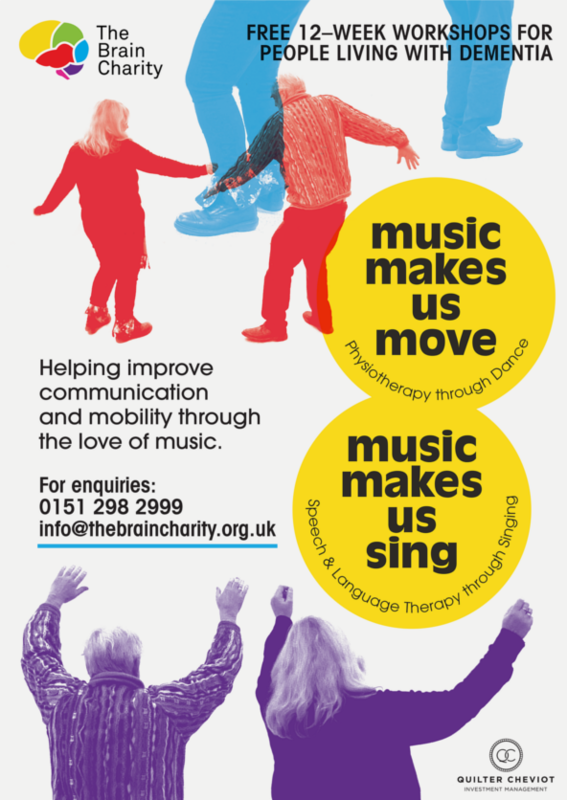 The Brain Charity is offering speech & language therapy through singing classes – a social, accessible way of engaging in this therapy. Workshops aim to develop communication abilities and boost confidence. Singing workshops will be co-run by a professional singing instructor and a qualified Speech and Language Therapist. The deterioration of physical ability often results in social isolation and lack of independence, and can cause a great deal of mental health & wellbeing issues for people with dementia. Community based neuro-physiotherapy can help inclusion and self-esteem by providing exercises that reduce the risk of trips and falls. The Brain Charity is offering regular dance classes, with moves based on wide-ranging and high impact physiotherapy exercises. Workshops aim to improve mobility and empower individuals to retain their independence for as long as possible. Dance workshops will be co-run by a professional dance instructor and a qualified Neuro-physiotherapist. All workshop leaders have experience of working with people with dementia, and we look forward to offering these sessions in a warm and friendly atmosphere. Fun, relaxed participation – no experience necessary! Refreshments will be provided. Carers are welcome and encouraged to join too. The program will run for 12 weeks to maximize the benefits of the therapy. For more information please contact Kym Ward at The Brain Charity.